Cartoonist Dogan Güzel was among the journalists arrested in the government raid on the Kurdish newspaper Özgür Gündem in Istanbul on Tuesday. Cartoonists Rights joins Reporters Without Borders in condemning the closure of the newspaper and calls for the release of the journalists. We have recently come to know that our friend and former Courage in Editorial Cartooning award winner, Dogan Güzel, has been rounded up in a raid on his newspaper in Turkey. We call on the government of President Recep Tayyip Erdogan to quickly release our colleague Dogan Güzel, and all other journalists who are legally carrying out their professional duties in accordance with their constitutional rights. This kind of thing will happen in any country where the head of state is allowed to act as if they are more important than the constitution that they swore to protect. 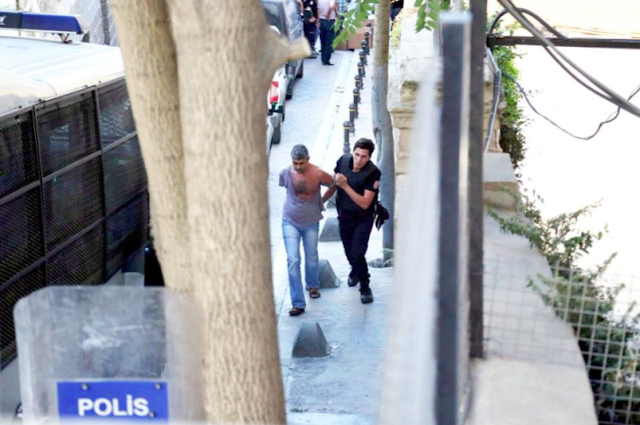 All of Turkey seems to be evolving into its own prison.